In contrast to my cropspace is the interior modern. 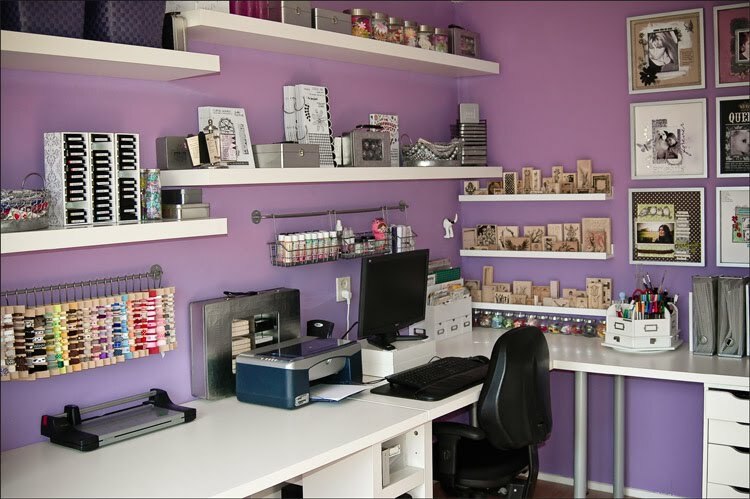 For my studio I choose the colors purple and White(& Black). And for the accents I used metal/silver, like the Tim Holtz storage boxes (Cropper Hopper), which I believe are not for sale anymore. Like many other craftrooms I have storage systems from Making Memories and Ikea. Most of the furniture are also from Ikea. 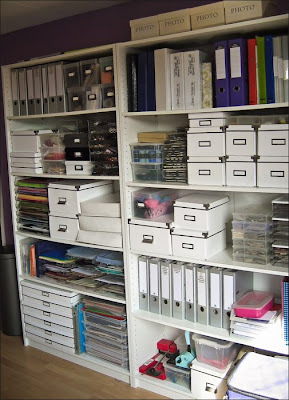 That's just what I need to do -- I have so much, and it's all kind of in a jumble in bags...oh, to be orderly! What a truly amazing work room. Organized is an understatement. Oh, wow! What BEAUTIFUL studio!!! Oh I love love love the purple with the white. I've very much been in a purple mood lately and I'm not sure where to express that...new bedding maybe? 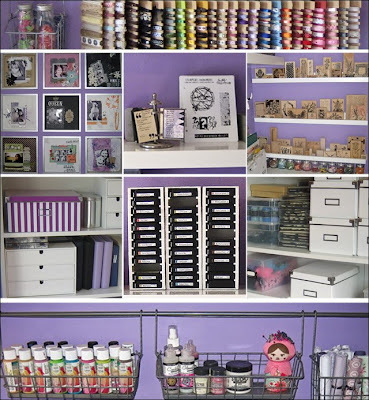 Love all your crafty organization as well. Amazing! Just beautiful, THIS is the room and the organisation I want. Wow..this is really beautiful. I love the white furniture against the purple too. Very striking! Lovely space kim! You have given me so much inspiration! I absolutely love the white against the purple. It inspires me to put more of my white shelves and units against the blue wall in my scraproom. I also am loving how neat and uncluttered it feels. I also love the labeling of the photo boxes and stuff. Great job! I'm drooling on my keyboard! What a beautiful space! Maria, your studio space ROCKS! It is so beautiful and organized.